In this Race for Wool map, two teams of four (or any number really) must conquer the hottest areas Minecraft has to offer with heavy PvP and PvE gameplay. There are three areas, each with their own wool; The Mesa Mineshaft, the Nether Fortress, and the Firey Volcano. In case you're not familiar with how Race For Wools usually work: There are two lanes that mirror each other perfectly, one for each team, and somewhere in each lane are three wools, and whatever team delivers those wools to the beginning of their lane wins. No-one can access the other team's lane, or occupy the space in-between the lanes. You're allowed to shift over the edge, but nothing more. Cheating is impossible, I've made sure of that with some command magic. The game has a built-in 'time limit' of 60 minutes, where if one team is in the lead by that time, they will win automatically. But if there is a draw, the game will go into indefinite overtime until a new wool is placed, and the Victors declared. Only wools placed on the monument count! This map uses the keepInventory gamerule, but be warned! If you die with the wool it will vanish from your inventory! This map uses custom advancements, so keeping track of your own team's and opponent's progresses is as easy as pressing L.
Players can earn XP for shooting players, with extra XP incentive to kill players, especially those who are carrying wool on them. 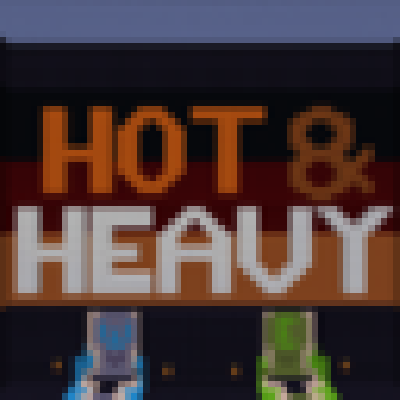 Send your friends the download link to the Hot and Heavy Resource Pack. It's not 100% essential, it's just a few textures to help some things make a bit more sense. Get some of your friends, fire up Minecraft 1.13.2, and enjoy playing this Hot and Heavy Race for the Wool!